@notzippy E.g. Error(Unknown public key EB774491D9FF06E2) for tor-browser. Happens for some other packages, too. Not for all though. Usually I could just import the key, but here it doesn’t work. The other problem is already solved. I have updated my system and now the number keys randomly stop working. I also can’t update some packages via AUR, because it shows an PGP signature error. My semester just started and I need this computer to work soon. Okay I thought it was because of my colloquial language. Never happened to me before! @ssspacez: Discover just shows plasma extensions for me. I can’t see any arch packages or AUR. If I hit settings nothing happens. Pamac works fine for me, I just want to have shadows for GTK apps! Man, why was my previous post flagged as spam??? 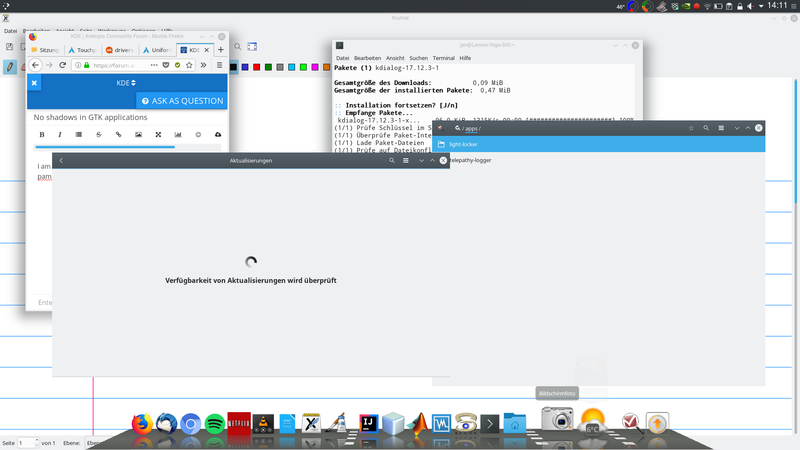 @ase11: You have to install either via antergos-kde-setup (didn’t work for me) or install plasma-desktop. Then I would uninstall everything gnome-related, because in my case gvfs is eating a lot of resources. I think some applets of the cairo-dock are also not working anymore, because I uninstalled gvfs, but the Plasma desktop gives you a lot of alternatives. The breeze-gtk theme worked well except for missing shadows of windows, but I already created another thread for that. @Bryanpwo: Okay, in the thread he says that KDE has improved, but the difference for me is just unbelievable. My laptop now runs faster and cooler than with any other desktop environment. On Cinnamon, GNOME or LXDE my processor used to run around 50°C when idle. On KDE it runs at 35°C !!! when idle. That is cooler than my friggin’ blood brah! On Cinnamon I was experiencing BT connection problems - gone! I was having memory problems, being that the longer I used Cinnamon, the more memory was used for cache. I had to hit Alt+F2 and type “r” to reload Cinnamon and I got free memory again. This problem is gone as well. I have no idea why there is such a big difference. I am guessing that Cinnamon just runs well on Mint. I have never had problems with it on MInt. Thank you for the quick reply! I already tried the package you are talking about. When I installed it, I had two title bars, so I dropped the solution again. Is there a way to deactivate the other one? I am missing shadows for some GTK applications, e.g. pamac or dconf-editor. All the GTK applicatios use the Breeze theme, but they are lacking the shadow effect. I have switched from Cinnamon to KDE, because I realized that KDE does handle my resources better. This is strange to me, because KDE has so many more effects. It works flawless now, but I want to have pamac and lightdm in the KDE look. I installed the respective KDE integration packages. Pamac now appears in the plasmashell, but the window is still GTK3 and doesn’t look nice. I installed the lightdm-kde-greeter, but it didn’t have any effect. The antergos-kde-setup is faulty btw, since the names of kopete and sweeper have changed. How can I make the Antergos stuff integrate more nicely? Hey thanks for the replies. I have been on Windows for quite some time now, because I am afraid that the extreme heat will damage my laptop in the long run. I installed the LTS Kernel but the problem persists with no change at all.